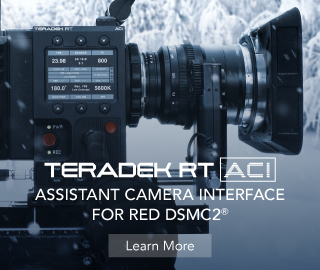 Even though 3-axis handheld gimbals like the DJI Ronin and Freefly Movi M5 are overall fantastic filmmaking tools, they easily get too heavy to hold for extended periods of time and typically are limited to stabilizing rotation movements only. 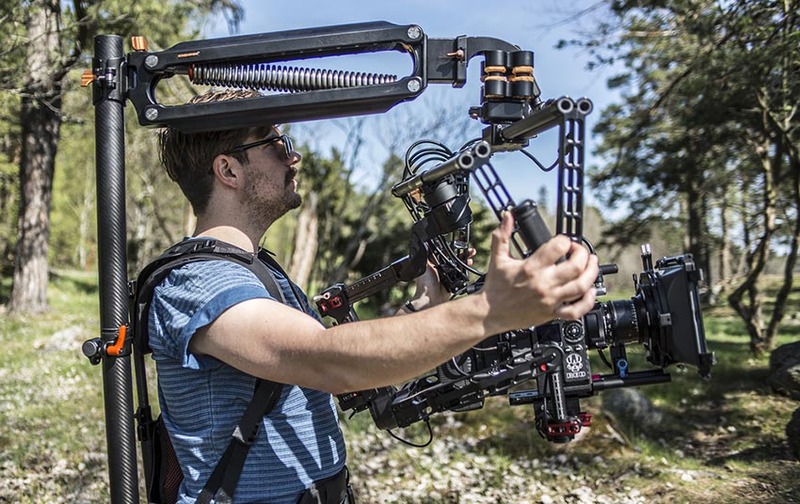 The Kinehawk Nostromo support system tackles these drawbacks and not only supports the gimbal weight along with the attached camera and all the accessories but also isolates vertical movements much like the original arm of a Steadycam. 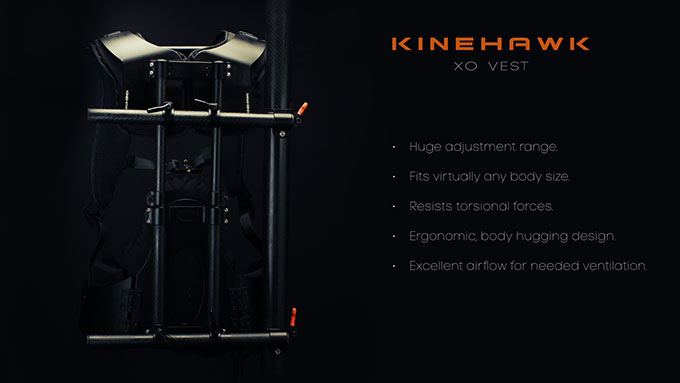 Billed as the first modular, multi-purpose camera operation device, the Kinehawk Nostromo spatially stabilizes the majority of three axis gimbals, allowing the operator to perform multiple style shots when wearing the innovative XO vest. In addition, the platform can be mounted to a vehicle, trackless dolly or any other device for even more creative camera movements on the fly. Due to its utterly modular design, the Kinehawk Nostromo can be easily assembled in different configurations and adapted for multiple filming scenarios and situations. Unlike a full blown Steadicam outfit, though, the platform is very easy to adjust and operate. 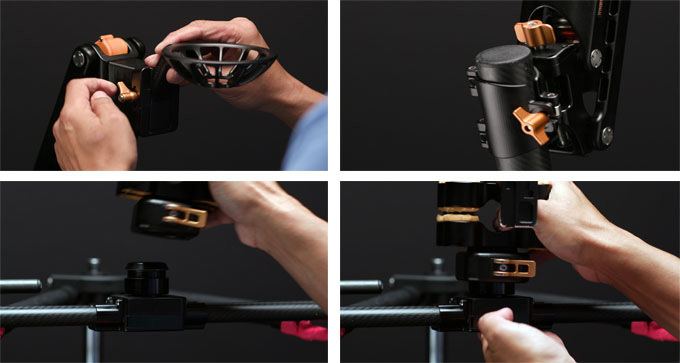 You simply need to snap the gimbal to the arm via the quick release connector and then rotate the dedicated adjustment knob until the arm is level. 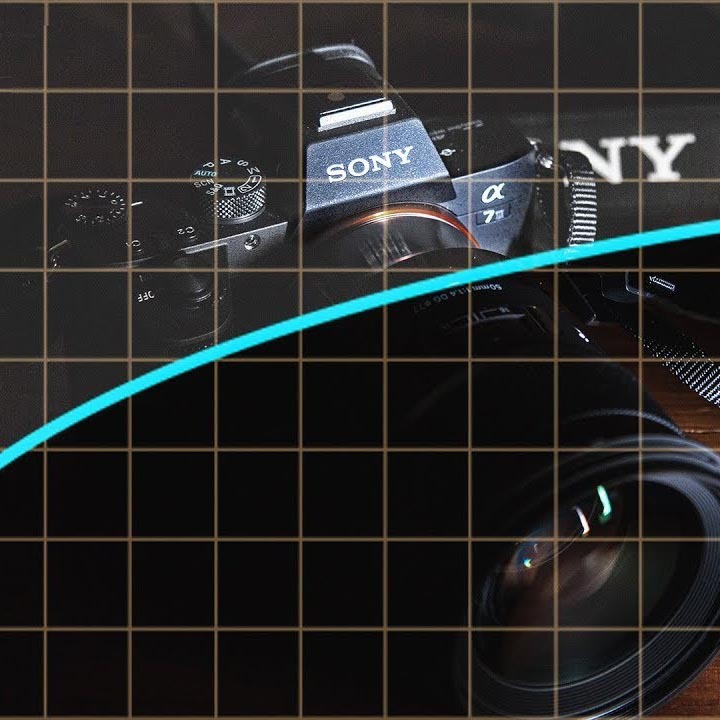 Furthermore, the proprietary handles of the system allow you to pan and tilt through a point close to the camera’s center of gravity with ease. There is also a 100mm bowl module included in the kit that can accommodate multiple fluid heads. You can also use the platform for handheld shooting with the provided cord based support. On top of that, the Nostromo vest is designed to resist torsional forces and also has a huge range of adjustment fitting virtually any body size. The system is built with high-quality materials such as aircraft grade aluminum, carbon fiber, titanium and stainless steel that make it not only light and flexible but also sturdy enough to accommodate both a gimbal and a camera body weighing up to 20 kg. 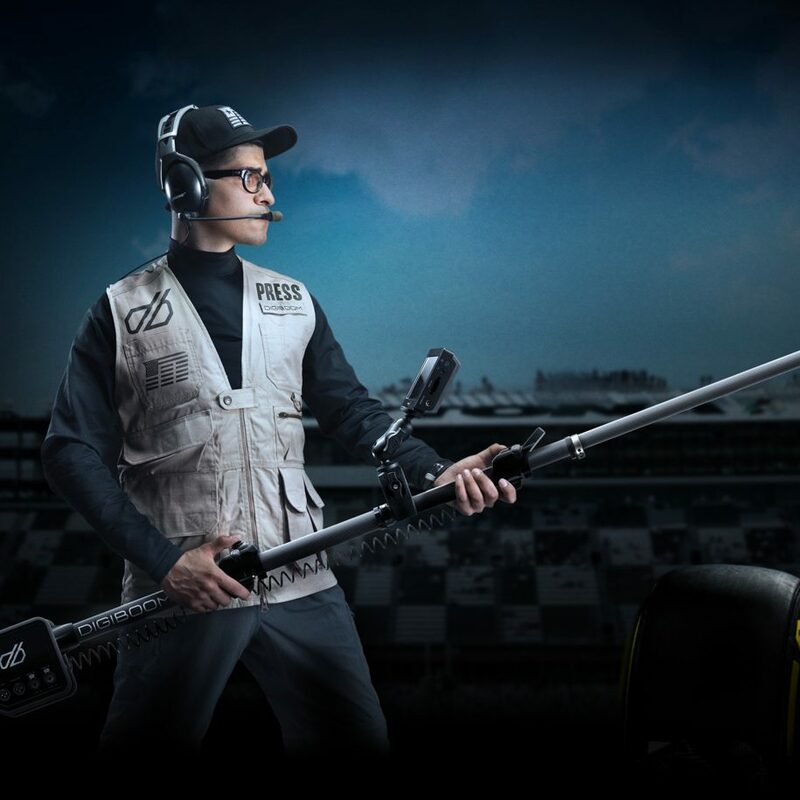 The arm, on the other hand, can be placed at various heights on the vest’s support tube and the camera and gimbal can also be inverted, to give a full range of shooting heights. Modular design allows it to perform a number of filming tasks. Ease and speed of use due to quick release connectors and one knob adjustment. 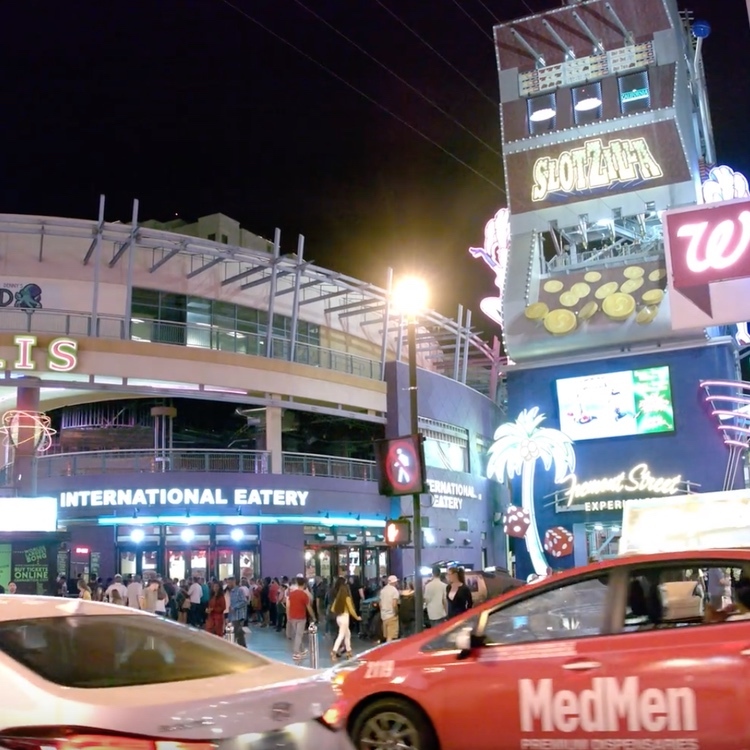 Adds spatial stabilization to a gimbal’s rotational stabilization. Highest quality materials: Aircraft grade aluminium, carbon fibre, titanium and stainless steel. Light enough to carry all day. Tough enough to take the worst a film set can throw at it. An innovative vest can fit virtually any body size, resists torsional forces and distributes weight to the hips. Smooth, near weight free booming. The Arm attaches to any standard 43.3mm/ 1½” pipe. The small silhouette allows moving through tight spaces. Connect to a car, quad bike or trackless dolly for stabilized vehicular shots. 100mm bowl module allows the use of a fluid head with the stabilizer arm. The Easy module allows simple, cord-based camera support for hand-held filming. The start of the official Nostromo’s Kickstarter campaign is just around the corner (launch date is March 6th), so if you want to learn more about the project in advance, head over to the Kinehawk’s official website here.